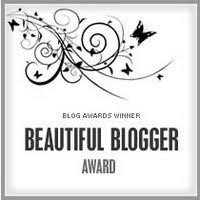 Its Always Something Around Here: Blogger Award-Big Thanks! Thanks so much to my new bloggy friend Shelle at Mommy Can't Sing http://mommycantsing.blogspot.com/ for this award. You are so sweet and I can't wait to meet you at boot camp. 2)I have a slight addiction to bundt pans and baskets.....weird but true! 4) I LOVE all things chocolate!! 6)I am a super shy person. 7) I love to work in my gardens it is one of my all time favorite things to do. COME ON SPRING!!!! 2) Linda at Lindanjake http://lindanjake.blogspot.com/she always leaves the nicest comments and I love her blog. 3) Nancy at Bacardi Mama http://bacardimama.blogspot.com/ she was one of the first visitors and commentors when I started blogging. 4)Alexis AKA MOM http://mom2mycrazy2.blogspot.com/ She is a fun lady who makes me laugh....I love how she is so real in her blog. 5)Ericka at Rose Colored Glasses http://ericka-designsense.blogspot.com/ she inspires me with her projects. Go check them out! 6) Susie Harris at http://www.susieharrisblog.com/ I just love her blog she is a sweet lady! 7) Amy at The Finer Things http://amysfinerthings.com/ Her blog is one of my favorites! Go show these great bloggers some love! What to do with the award! What a sweetheart, thank you so much! I'll post about this tomorrow and list my 7 things. whooot! Thanks and I agree you should have tons of awards. We both share the OCD thing...LOL and of course who does not love chocolate. Going to have HOT chocolate pudding tonight as a treat......heaven on a spoon. Visiting from MandyP's site! Congrats on your award! congrats on your award and thanks for stopping by. I love these awards because you learn random things about people.